I'm joining Martha's Favorites and Artful Affirmations for another Tea Cup Tuesday. 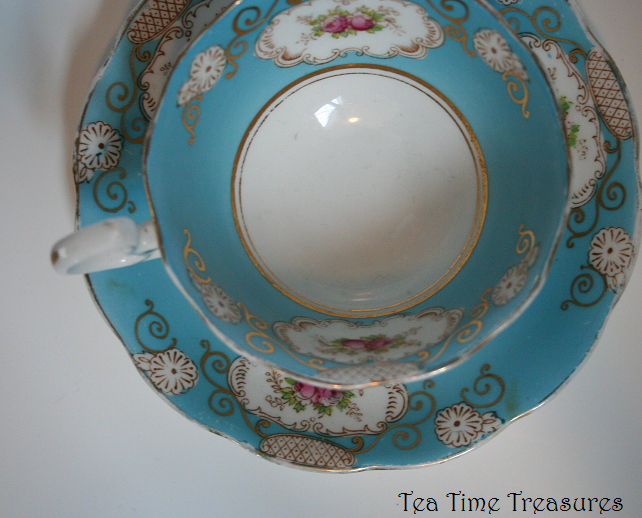 Today I want to show off one of my oldest tea cups in my collection! 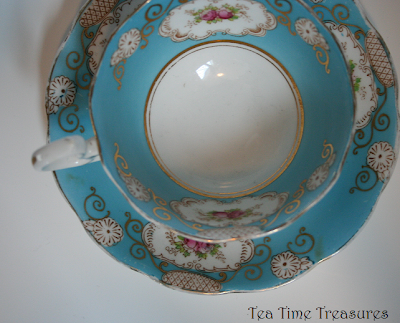 As with most of my tea cups, I found this little blue cup at a garage sale. It is well used and well loved. The gold is waring off, but what can you expect after all those years? Maybe one day I will find another cup like this one in a different colour! It was produced in many different colours, such as yellow, purple, green and pink! This Royal Albert un-named Doris shaped tea cup was produced between 1927-1935, based on it's back stamp. I wonder what the '6376' number means? Thank you so much for sharing your cup with us today. Oh gosh, my heart beat skips the beat! this is trully beautiful cup! How I love this cup so much! Like you, I really love cup especially if it is from Royal Albert. I got few myself. I've seen this cup in pink from eBay.. and wish you good luck to find the rest of the colours! thanks for sharing. Happy New Year. That is a gorgeous teacup. The blue color is so pretty and so is the pattern. Just lovely and the color is divine! Happy Tea Day! This one is absolutely stunning! My kitchen counters are this colour....and I want it....are you interested in selling it? I'm not kidding?! Hello Creative Carmelina, Thank you for the nice comments. I too am quite fond of this tea cup, and am not able to part with it! I wish you luck in finding one like it!! Hello ladies. I couldn't help but notice that someone is looking for this set of Royal Albert Crown China pattern #6376. Well, it just so happens that I have a set of 4 Tea Cup, 4 Saucers, and 4 Bread plates! But i cannot even find one anywhere to compare price! So if the offer is right, I may just let them go! Hope you're all still there! I have two cups and saucers that I've had for 31 years and my mother had for a very long time before me. I'm selling them. I also have two dessert plates (at least that's what I think they are). Anyone interested? I have 6 cups,6 saucers,6 plates,cake plate, milk jug,sugar bowl.